Ghostwatch was a Screen One production broadcast on BBC One, October 31st, 1992 at 21:25. It was written by Stephen Volk, directed by Lesley Manning and produced by Ruth Baumgarten, and starred Sir Michael Parkinson, Sarah Greene, Mike Smith and Craig Charles. The one-off drama special purported to be a live broadcast from a haunted council house located in the fictitious suburb of Foxhill Drive, Northolt. Shortly after its first and only UK television broadcast, a considerable amount of discussion was raised concerning the show's impact, as many viewers nationwide believed what they were seeing was actually happening. For an independent overview of the show, the Ghostwatch Wikipedia page is often a great resource. WHERE CAN I BUY GHOSTWATCH & GHOSTWATCH: BEHIND THE CURTAINS? The BFI released a single-disc edition back in 2002 to mark the tenth anniversary, which for a time was quite rare to find, and depending on condition, had been known to go for around £20-£50 on auction sites and online stores such as eBay and Amazon. A VHS edition was also released the same year. 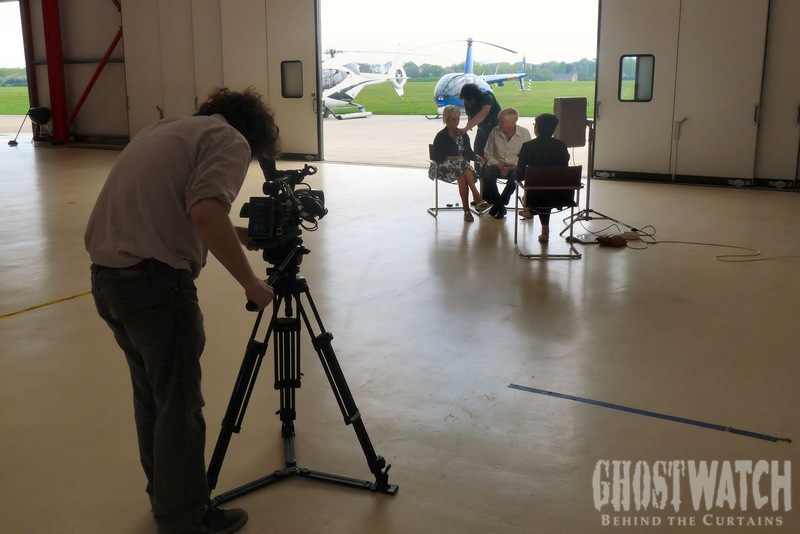 The DVD features an audio commentary with Stephen Volk, Lesley Manning and Ruth Baumgarten, a mini documentary entitled, Shooting Reality, and other downloadable DVD content. In October 2011, 101 Films released a vanilla-disc edition of Ghostwatch on DVD (R0) which is currently available from the usual outlets. In March 2013, lawmanproductions.co.uk released the completed documentary, Ghostwatch: Behind the Curtains on DVD. There is also a companion book of the same name, with extra/unseen content, currently available over at Lulu.com, and a full, uncut transcript created in mind for students, and the hard of hearing. In October 2016, BBC Store released downloadable versions of both films, through their Frightmares collection. HAS GHOSTWATCH EVER BEEN REPEATED ON TV? To date, Ghostwatch has not yet been broadcast again in full in the UK, although over the years, clips have been shown on BBC One, BBC Four, Channel Four and E4 (see our YouTube page for a number of clips). Overseas, Ghostwatch has been shown on the channels, Scream in Canada, and Canvas in Belgium. In October 2011, the show was briefly available to download on the now-offline BBC Global iPlayer app. IS IT TRUE THAT GHOSTWATCH WAS BANNED FOR TEN YEARS? Strictly speaking, no. For something to be banned outright, the BBFC must refuse to classify it for sale within the UK (the show was subsequently granted a 12 Certificate). 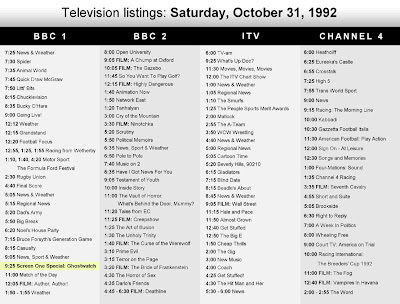 Over the years, it has been argued that Ghostwatch was suppressed which is a slightly more accurate description when you consider it has yet to be shown again in full on any channel. The ten year 'ban' theory possibly stems from the fact, the first time the show was released on home media (DVD/VHS) was in 2002 - ten years since it was first broadcast. AT WHICH STUDIO AT TELEVISION CENTRE WAS GHOSTWATCH RECORDED? Actually, none of them! Ghostwatch may have been set at what was BBC Television Centre, White City, but in reality, the show was filmed at Studio D, BBC Elstree Studios, Clarendon Road - the old ATV studios, where they also filmed The Muppet Show, funnily enough. Going by experience, it can be very easy to confuse BBC Elstree with Elstree Studios where the Star Wars and the Indiana Jones films were filmed, among many others. In fact, there have been a few different Elstrees, situated at various locations. HOW MANY VIEWERS TUNED IN TO SEE GHOSTWATCH? Two decades on, Ghostwatch remains one of the highest rated single dramas of all time. With thanks to Stephen Freestone for the above! HOW MANY COMPLAINTS DID GHOSTWATCH GENERATE IN TOTAL? According to various sources, including the BFI DVD Audio Commentary, the BBC received anywhere in the region of 20,000-500,000 phone calls to the main switchboard - comprising a mixture of complaints, praise and enquiries as to whether the show was real or not. During an interview with Samhain Magazine in 1996, utilising a breakdown from British Telecom, producer, Ruth Baumgarten also estimated 100,000 calls during the peak five minutes of telephone activity, and as many as 1,000,000 calls in total, throughout the evening. That said, in 1992, Anne Robinson stated on Points of View that there had been 835 calls to the Duty Office in which 382 people said the show had been an "insult to their intelligence," 275 found it to be in "poor taste," 62 just had a "general moan," and 116 "thoroughly enjoyed it." During the edition of Biteback that discussed the show, host Sue Lawley claimed there had been 20,000 calls made to the BBC Switchboard following transmission. According to the E4 clip show X Rated: Top 20 Controversial TV Moments, Ghostwatch garnered 2215 official complaints following transmission. WHERE CAN I FIND THE DELETED SCENES THAT AREN'T PRESENT ON THE DVD RELEASE? In terms of deleted content, the BFI DVD is only missing the BBC continuity announcement and Screen One ident which you can watch below - nothing else. You'd be amazed at just how often we get asked this, but both DVD versions are virtually identical to what was broadcast in '92 - which too featured the end credits. The newer 101 Films release also reinstates the classic pre-titles Screen One 'Boulder hurtling through the TV' sequence. ARE THERE ANY OTHER FILMS LIKE GHOSTWATCH THAT I MIGHT ENJOY? Sure! Alternative 3 is a similar British creation that was made some years before Ghostwatch. Then there's the wonderfully spooky The Blair Witch Project, [Rec], The Last Broadcast, and Paranormal Activity to name but a few. Others that are worth checking out, but might be more difficult to track down include, Alien Abduction: The MacPherson Tape, Special Report: Journey to Mars and Without Warning, all of which are a lot of fun, if you're fortunate enough to find copies. And not forgetting the original, War of the Worlds radio broadcast, which still packs a punch today. WAS THERE EVER A SEQUEL TO GHOSTWATCH? HOW CAN I ARRANGE A SCREENING OF GHOSTWATCH? There have been quite a few Ghostwatch screenings over the years. All requests should go through the appropriate channels at the BBC. National Séance is an annual event in which fans worldwide play their own personal copies of the show at precisely the same time Ghostwatch was originally broadcast (21:25 GMT, 31st October) and then comment on the proceedings via Facebook and Twitter. IS THERE A COLLECTIVE NOUN FOR FANS OF GHOSTWATCH? 'Ghostwatchers' seems to be the most popular term used. Although we also like, 'Pipes-Phobes'..! 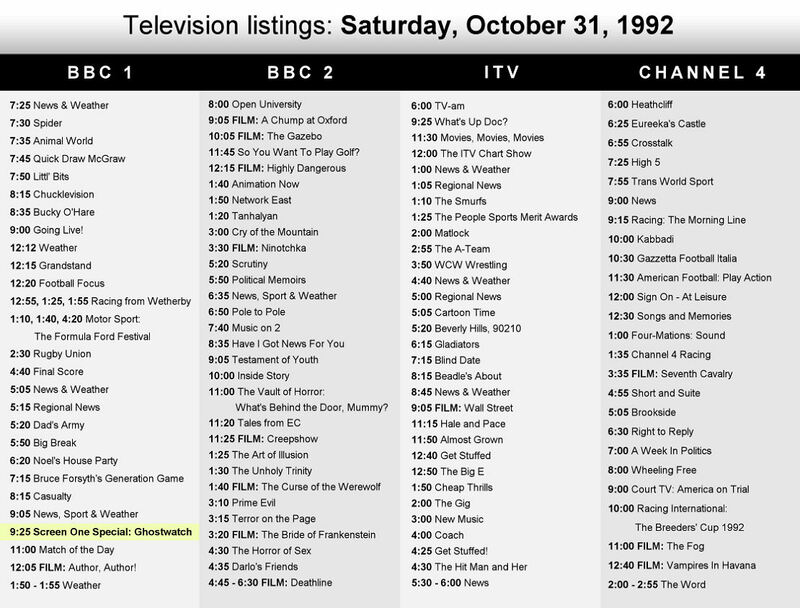 WHAT ELSE WAS ON THE TV THE NIGHT GHOSTWATCH WENT OUT? ROUND AND ROUND THE GARDEN... LIKE A TEDDY BEAR? ... Didn't believe the story of Mother Seddons, did you..? Ahh... Fe-Fi-Fo-Fum..! The on-screen ‘map’ graphic used to show where phone-in guests are calling from was actually a printed artwork, filmed on set using a locked-off camera, vision mixed, and fed into the video-wall for the actors to respond to, ‘live’. Phone-in caller, Mary Christopher is actually Ghostwatch director, Lesley Manning, as the original actress hired for the role couldn’t deliver the lines as intended. Likewise, the voice artist brought in to voice Pipes the Ghost was also substituted for Manning’s own un-credited performance. The grey BBC trucks as seen in the opening title sequence are 1988 British Leyland Freighters. Due to strict demarcation rules within the BBC, director, Lesley Manning had to choose whether to make Ghostwatch either with a dedicated Studio crew or Outside Broadcast staff. This resulted in the show’s 'hero' scanner truck effectively arriving on set as a prop, even though a manned O.B. Unit would have been perfectly outfitted for such an event. The ‘Ghost in a Sheet’ painting hanging over the studio fireplace is actually a print of an existing piece by Austrian-Irish artist, Gottfried Helnwein, which Stephen Volk first saw at an exhibition in Vienna. The strip of technical information displayed on-screen by Chris Miller’s thermal vision scope is time-stamped whilst the camera is in operation, and had to be augmented in post-production to accurately read “1992-OCT-31”. Actively seeking out the latest on-screen graphics throughout the shoot, Lesley Manning utilised the now common Page Turn effect before it was due to premiere on popular music show, Top of the Pops. The smeared-looking black and white graphics that adorn the BBC studio set were made by dragging a Gothic door knocker across a photocopier during a scan cycle. The Earlys’ home computer as seen in their living room is from the Commodore CBM-II range. The model shown in Ghostwatch resembles a CBM-610, the European version of a B-128. The rumour that the show’s makers had wanted to add a high-pitched tone which would agitate viewers’ pets during the broadcast is mostly true. Stephen Volk suggested it, but as soundtracks are ‘capped’ for transmission [meaning, limited in pitch, volume, etc], even if permission had been secured to go ahead with the idea, technically-speaking, it would not have been possible. The distinctive sound of Tunstall’s disembodied wailing cats can also be heard in 1987 comedy-drama, Withnail & I — specifically, the first scene to feature Richard Griffith’s cat-loathing character, “Uncle Monty”. Moments after the Police arrive at 41 Foxhill Drive, if you look carefully at the WPC exiting the passenger side door — amidst the chaos, she accidentally knocks off her hat, and laughs whilst putting it back on. When Craig Charles jogs over to the nearby playing field to interview Yvonne Etherly, screenwriter, Stephen Volk can barely be seen on the right-hand-side of the crowd. The board-game that Kim and Suzanne are playing whilst Sarah relays her true-life ghost story to camera is the Disney edition of Sorry! released by Waddingtons in 1991. Additionally, the bowl of crisps on the same table are Golden Wonder Cheese & Onion flavor, don'tcha'know. We've got some lights... in the studio.